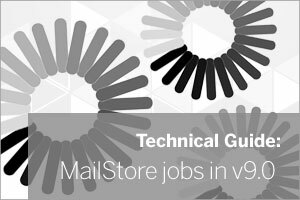 If you’ve recently made the move to MailStore version 9, it’s entirely possible you’ll be sat there wondering why on earth all of those archiving jobs you had set up can’t be modified any more. You’ll hopefully be pleased when I tell you it’s not a mistake and nothing’s gone dramatically wrong, it’s just that MailStore are now adopting a new and far more efficient way of automating jobs that no longer needs the old Windows task scheduler method. So in earlier versions of MailStore, you would have had the choice of either running your particular archiving job manually by simply selecting and running the job, or you could schedule it. When you were choosing to create and then schedule a job in MailStore, this was simply using MailStore to create a Windows scheduled task behind the scenes, and this would automatically trigger the job to run at specific points in time. In version 9.0, this ability to schedule a job no longer exists. It’s been removed in favour of a new approach whereby jobs are just configured to automatically. Cue spinny wheel-type progress indicators as show below. The idea behind this is that by running jobs continuously, what you’re doing is providing a better spread of the server load during the course of the day which is ideal for those busier mailboxes in particular. 1) A delay to wait between running the job. 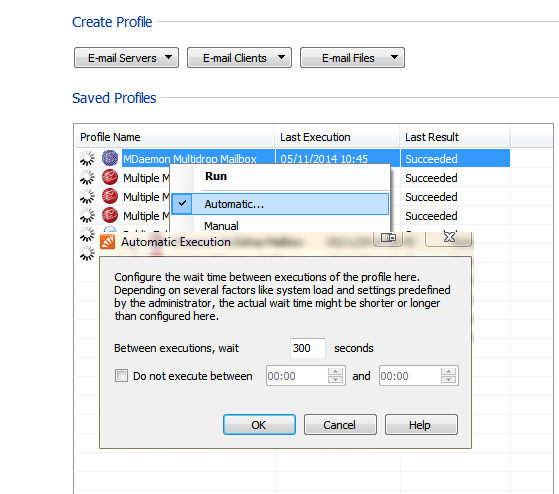 This allows the jobs to leave some idle time on the email server and stop jobs from running continuously. 2) Ability to define a time window the job should not run. This is handy if there are busy times you’d rather MailStore wasn’t doing anything. I’ve just upgraded, what do I need to know? The best way to answer this is to look at a typical scenario with an on-premise Exchange server and journal mailbox we’re connecting to in order to archive mail. In MailStore version 8 we would have recommended running a ‘journal’ job every five mins to trickle the email in throughout the day. In v9 however, we now suggest using the default options to run the job automatically 24 hours a day but to wait 300 seconds between jobs running. 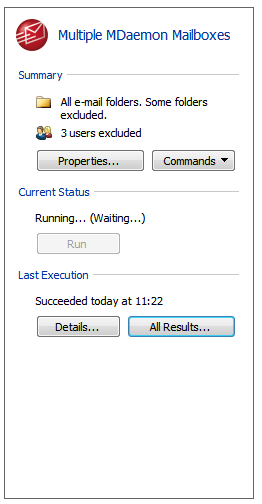 The job is still running all of the time but it will never run more than once every five mins ( 300 seconds). The advantage of this approach is that if for any reason the job takes more than that time to run then a second instance of the job would not be set running in the background. It’s unusual to happen but occasionally it can do if MailStore is offline for an extended period or the option to delete message from the journal mailbox is turned off. 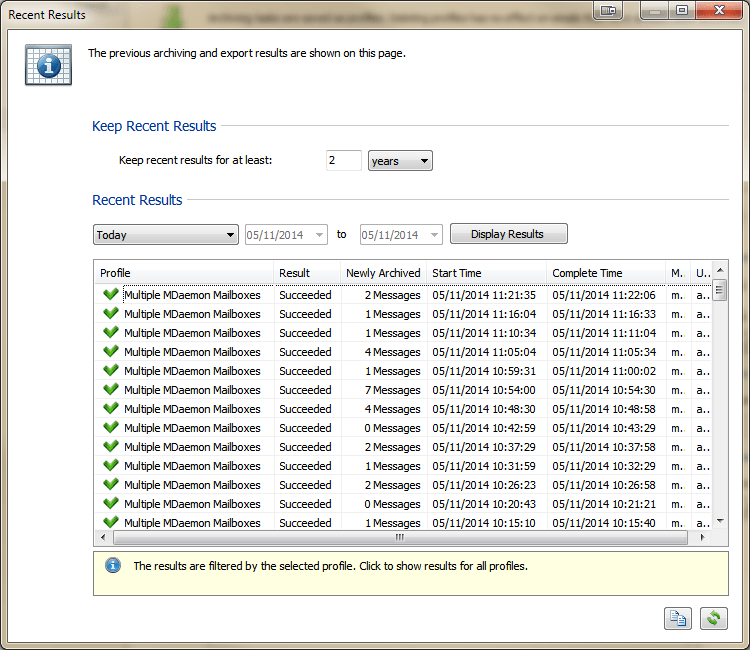 The job for archiving multiple mailboxes would usually only run once per day in version 8. This was mainly because they could take a while when tackling a large number of mailboxes. In version 9 though, due to the way a local cache is kept for all users mailboxes, the time it now takes to analyse a mailbox for changes and archive mail has vastly improved as you’ll notice from the illustrations below. A multi-user mailbox job that archives 100’s of users may have taken a few hours in the past, now it may take minutes which I’m really very pleased about. Importantly, now jobs are so much faster, it’s possible to increase the frequency while also better spreading the load across the day. In fact, in some deployments, the ability to update the archive by only looking at user’s mailboxes and removing the journaling job altogether may be an option. You must remember though, doing this introduces the likelihood of missing a message should a user receive a message and delete it very quickly before the mailbox job had chance to archive it. Another nice new feature in v9 if you’re an administrator is the ability to clearly see the history of a specific job and how long it took to run. Each job now shows a summary window and under the ‘Last Execution’ section you can click on ‘All Results’ to show more details of when the job has run. You should hopefully see that the time taken to run the jobs has been dramatically reduced. If you’ve got MailStore set up so that when it connects to mailboxes, it also purges mail older than a certain age, there’s something be aware of. Let’s say you restore a message from the archive and put it back into your mailbox. Nothing’s actually changed about that message (including the date), so with these more frequent jobs in v9, very quickly it will be deleted again (still existing in archive of course). My suggestion here is that you simply run two different multiple user mailbox jobs. The second could be a copy of the first. but only the second job would be configured to delete old messages. We could then configure this job to only run outside of office hours in effect only deleting old messages when users should not be using them. Do you still need to ‘journal’? In the latest version 9, because mailbox jobs run continuously throughout the day, messages are archived within minutes of them arriving. You could argue that there’s no need to have a journal job running to take a copy of everything. This is true, but I still suggest you journal. Even though the window between jobs is small, there is still the possibility a user could delete a message during that time and as an administrator you’d never know. It also wouldn’t satisfy compliance legislation but more so, I just think it’s nice to have that absolute confidence when searching that you’re pulling back the entire conversation thread. Let me know how you’re finding it! Hope you found that useful – drop me a comment below and let me know how your upgrade went, what you think of the new version and of course if you have any MailStore related questions.